Placental alkaline phosphatase antibody recognizes placental alkaline phosphatase, also known as alkaline phosphatase placental type, Regan isozyme, alkaline phosphomonoesterase or glycerophosphatase. Mouse anti Human placental alkaline phosphatase antibody recognizes placental alkaline phosphatase, also known as alkaline phosphatase placental type, Regan isozyme, alkaline phosphomonoesterase and glycerophosphatase. There are at least four distinct but related alkaline phosphatases: intestinal, placental, placental-like, and liver/bone/kidney (tissue non-specific). The first three are located together on chromosome 2 while the tissue non-specific form is located on chromosome 1. The product of ALPP is a membrane bound glycosylated enzyme, also referred to as the heat stable form, that is expressed primarily in the placenta although it is closely related to the intestinal form of the enzyme as well as to the placental-like form. The coding sequence for this form of alkaline phosphatase is unique in that the 3' untranslated region contains multiple copies of an Alu family repeat. In addition, ALPP is polymorphic and three common alleles (type 1, type 2 and type 3) for this form of alkaline phosphatase have been well characterized (provided by RefSeq, Jul 2008). 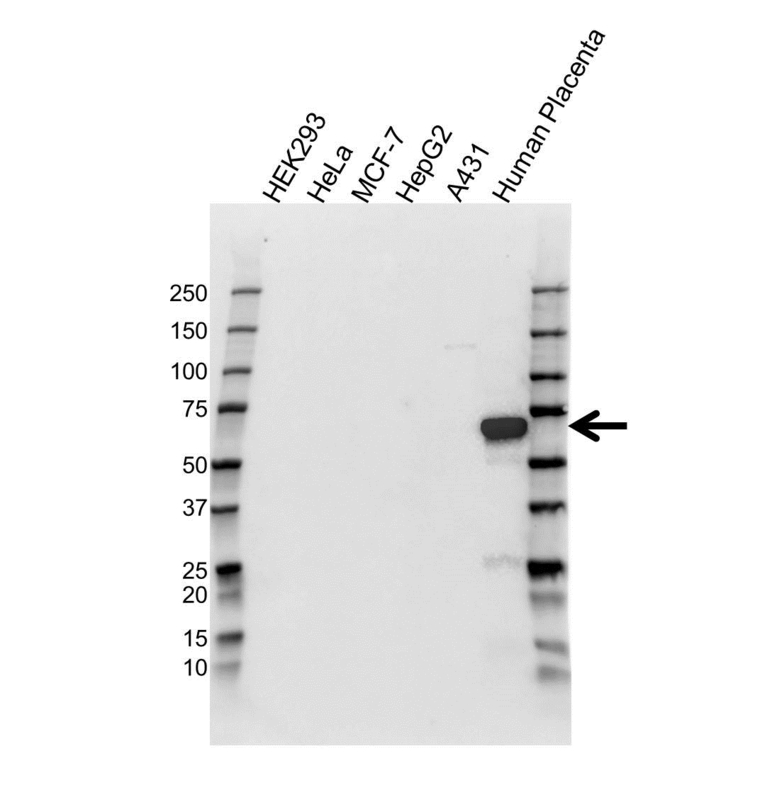 Mouse anti Human placental alkaline phosphatase antibody detects a band of 70 kDa. The antibody has been extensively validated for western blotting using whole cell lysates.